Combining your spa with an automated hot tub privacy gazebo and cover allows you to use your spa more and to reap the benefits of hydrotherapy. The COVANA replaces the conventional cover and seals over spas tightly to eliminate any water or chemical evaporation. The tight seal locks in heat and locks out cold to reduce costs related to heating with an R-21 insulation value. Have you ever come home from a long day at the office or perhaps you just put the kids to bed and wanted to unwind in your hot tub but thought it's too much effort or it's too cold to go outside to lift your water logged spa cover. Did you think, I wish it could lift itself? Shift your spa experience from the daunting task of lifting the cumbersome cover to enjoying your spa more often than ever before. The Covana is an automated all in one spa cover/gazebo enclosure that rises above your spa at the turn of a key. Is safety a concern for you? Have you considered having a hot tub in your backyard but thought the safety issues of having an accessible body of water outweighed the benefits? The Covana cover system securely locks in place either extended or closed. Its keyed entry provides absolute security and safety. When in the lowered position, the cover can support up to 600 pounds, providing more barrier protection than any other pool safety device. This is by far the best & safest hot tub cover on the market. Was your backyard your sanctuary until one day a family with children moved in next door? Privacy disappeared! Turn your backyard hot tub into the relaxing refuge it once was. 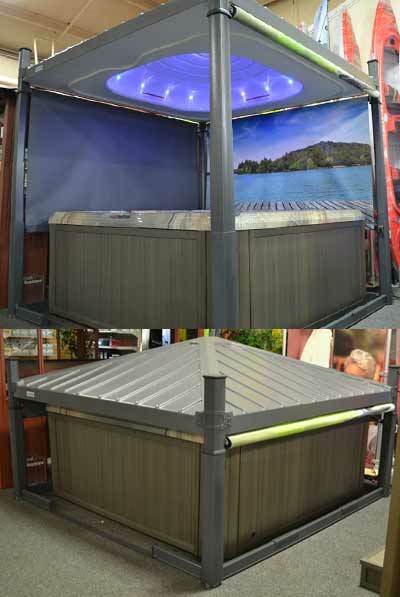 With the Covana automated all in one hot tub cover/gazebo enclosure safety and privacy are no longer a concern. The Covana's shades and screens provide privacy and shelter, the keyed entry provides absolute security and safety.